I have wanted to do an Athlete Profile of Ben Hecksher for awhile now, not because he does great at the races, but because he brings the right attitude to the game. I have wanted to do an Athlete Profile of Ben Hecksher for awhile now, not because he does great at the races, but because he brings the right attitude to the game. Everyone that strives to improve their performance, would do well to take on his clarity of motivation and single-mindedness. No frills, no dramas and no excuses, Ben simply gets the work done. He doesn't look for perfect training conditions, or free speed from the latest gadgets, nor does he over-analyse the training data. 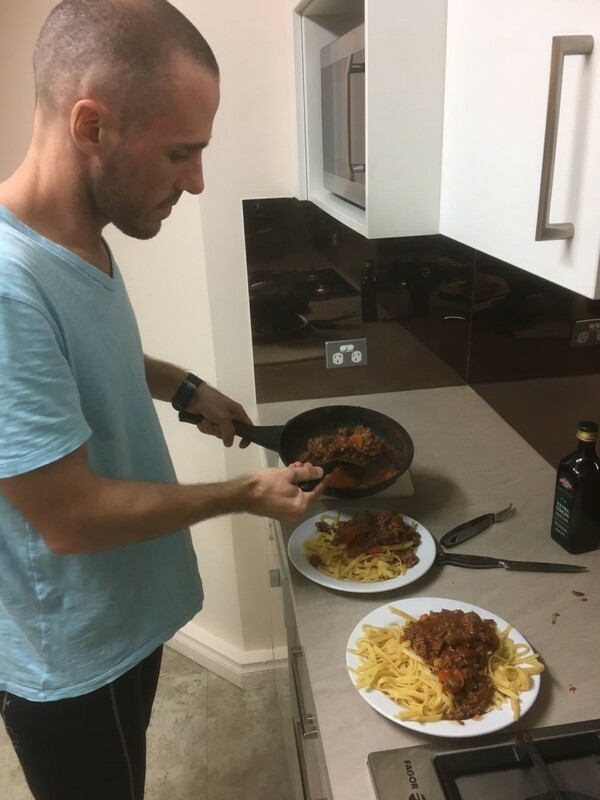 He takes care of the important stuff – consistency, recovery, nutrition, fatigue levels, effort levels and excellent comminuction with me. Ben trains hard to race hard. He undertstands that with high risk comes high reward and this is reflected not only in the fearless way that he races, but also in the manner in which he overcomes dissappointing perfromances (he just gets on with life). So it is with much happiness and a deep gratitude that I am able to share this interview with you 2 weeks after he went 9hr58 at IMWA 2016. Being the humble guy that he is, Ben will be the 1st to tell you that it's not a big deal and that there are others out there faster than himself. But we all know that, heck yeah – it IS a big deal!! Thanks for the inspiration! Well done mate, enjoy it! 1. First up – Tell us a bit about yourself. short background on work/ life/ sport etc etc / how did you come into tri? I grew up in Tasmania, so like most Aussie kids, I’ve had a crack at just about every sport, mainly cricket/football and I did a bit of competitive swimming up to about 12 even played a bit of semi professional rugby in my late teens. Again, like most kids in Oz I always had a BMX or mountain bike from a pretty young age. After Uni, I worked in London for 8 years.Central London isn’t the easiest place to ride and swim so I did a fair bit of running there and ran a few marathons in Europe which was fun. Given I’d always been in the 3 sports to some degree I always wanted to get in to triathlon so when I moved to Singapore for work in 2011where it’s a bit easier to swim and bike I figured I’d put the 3 together and get more serious about it. 2 What do you like about triathlon, what keeps bringing you back for more. I love that triathlon has no shortcuts. It’s a simple equation of what you put in is what you get out. It’s simply not possible to have a great race through good luck… Bad luck can knock you around and you need a bit of luck with weather and other things but you don’t have a great result through a lucky goal or 50/50 referee decision. Different things over time inspire me but I really love seeing the ‘older guys’ race. I got passed just before the finish chute in Busselton by a guy who won the 65-69 category. That really is something else. It’s great to be training and racing with other guys who I know are really strong. It’s awesome to be in the mix alongside them (and better still when you can beat them). 3. Share with us about your dream of going Sub 10. How did this crazy idea take root. Who/ What inspired you. etc etc What made you think you could do it. A few of my mates qualified for Kona and I know that they’re not that much different from me so I figured if they can do it, then I can train hard and keep getting faster also. Like I say, the equation is straightforward and when you’re starting off at a relatively lower base, the initial improvements can be huge. It’s pretty cool to get under 10 hours and whilst it sounds trite the goal has never really been ‘sub 10’. I enjoy training and racing so I just want to get faster. That said, now that I’ve gone under 10, I don’t want to go back above it!! 4. Tell us abit about the journey – the ups and downs. The great 70.3s then the tough days on the IM circuit. It’s a great feeling when you hit the target in a race. 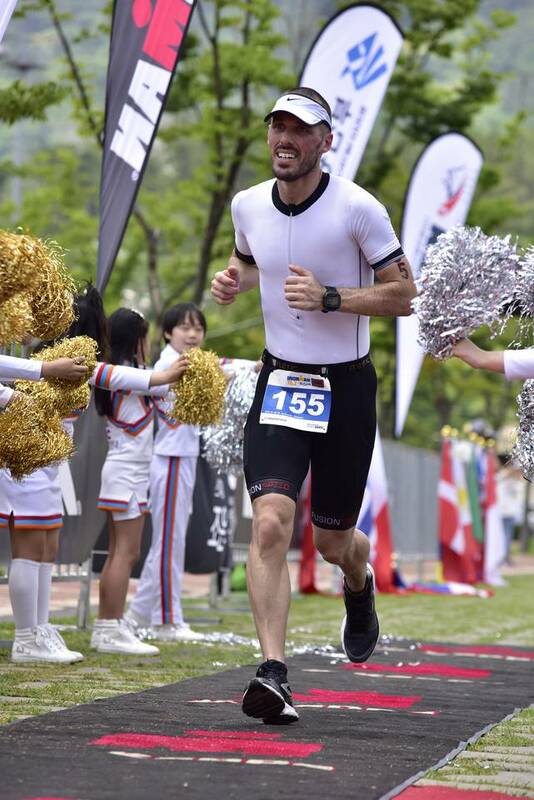 I got on the podium in Korea 70.3 earlier this year on what I thought was a super hard course. The swim was shortened as the sea freezing cold and rough; the bike was one short sharp hill after another on technical roads; then the sun came out blazing for the run. That was a great feeling to have a good result in a tough race. I’ve had a few rough days also. I crashed last year in Sydney and it’s not fun hitting the deck at 45kph! Luckily I was OK and only lost a bit of skin but my bike was toast. I didn’t finish Ironman Taiwan in October. The heat really knocked me around on the bike and I couldn’t stand in T2 because I was cramping so badly. I took nearly 20mins to get out of T2 and I tried to run a bit but I could only hobble to 4k and thought it better to save myself for another day. That really hurts. When you’ve trained hard for a race and it blows up like that it’s quite disheartening. All you can do is try to take away something for the next race. That said, it’s an experience I’d prefer not to have had. People often ask what you think when you cross the line, I’ve now finished 5 ironman and a bunch of other races and I think the first thought at the finish is something along the lines of ‘where can I sit down?’. Post finishing in Busso, I started thinking more about the result as I was watching the rest of the race for a few hours and it’s very satisfying knowing that I’ve done something pretty cool and that the hard work is paying off. Then the next few days, I start to replay things about where I can improve. 6. Briefly talk us through the race. High/ low points during the race. Standout thoughts at certain points in the race. Busso was great weather. Despite living in Singapore, I really don’t like the heat and can’t tolerate it well. Anyone who’s ever seen me on the running track will see how much I sweat! So I was happy that Busso was quite cool most of the day. Swim – was all good, it’s a straightforward course as one doesn’t need to look up much as you can follow the jetty out/back. I tried to go with a mate who’s usually a little faster than me but couldn’t hold on initially so I tried to just get in a rhythm. Then with about 500m to go, I had caught up to the group in front including my mate so I knew it would be a fast time. I was happy with 57mins as it was a few minutes up on my best split and was under my goal of 59mins. 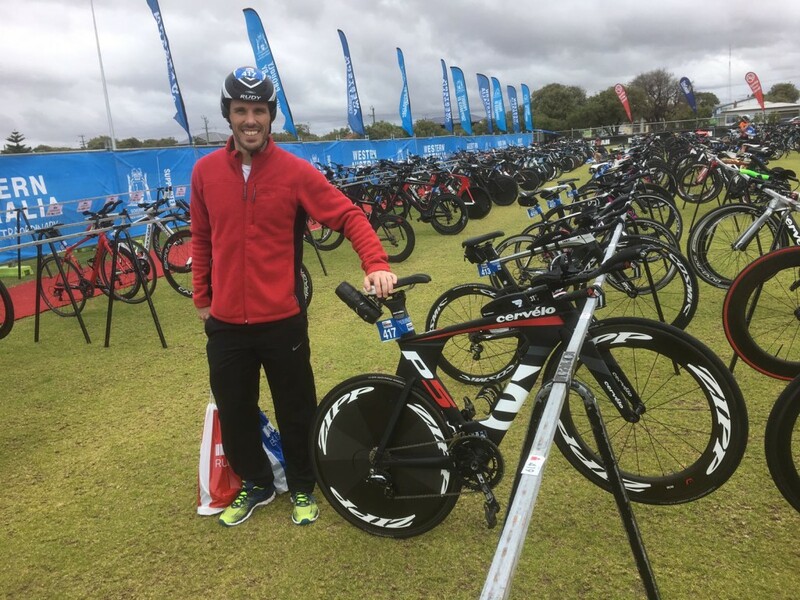 Bike – Busso has a fairly simple 2 lap course with no hills so it was all about holding pace, keeping my nutrition up and not getting carried away and to be honest the bike leg was fairly uneventful although the wind picked up a bit over the last 20k which was a bit unwanted. I’d aimed to bike between 4hrs 50 and 5hrs and overall was super happy to do 4hrs 58mins. Run – It’s funny how ‘easy’ the first half of an ironman run can be. I know it sounds odd but the pace is not super fast and when I’ve trained for a full marathon, running 20km or so isn’t THAT daunting but then there’s a LONG way to go. In hindsight, I ran too fast for the first half (about 1hr 42) and paid for it with about 7-8k to go where my pace dropped and I simply set my mind on going under 10hrs. Overall I ran 3hrs 53. I had hoped to run more like 3.35-3.40 so that is something to work on for the next race. I had a few anxious moments in the last couple of kilometers where I thought I may have got my timing wrong… Anyway, I managed to pick up the pace for the last few hundred meters and got under 10 hrs. 7. How did your physical training prepare you for the race? Racing in Busso was a late decision, I’d been training for Ironman Taiwan in October but as I said before, that didn’t go to plan, so I discussed with my fiancé and my coach and we agreed it made sense to do Busso. I’d worked hard for most of the year to prepare for Taiwan, so there were no worries on the fitness, the issue was maintaining that level for another couple of months for Busso. I also got a nasty cough/flu about a month out which I’m sure was down to a long training load and I didn’t quite recover enough from Taiwan. My coach and I changed the plan a few times to try to accommodate the sickness while maintaining fitness. 8. Talk about your training. Can you briefly describe your weekly training schedule. How and why that's working for you. I train more or less every day. I really enjoy it although the last 4-6 weeks before an ironman really tests the motivation and I get sick of seeing the alarm at 0430 on a Saturday morning. Age Groupers like me have a normal life to live and demanding jobs to do so juggling this with a fairly heavy training load with can be challenging. I find when there’s an opportunity to get in a quick run/swim, then I just do it. It’s amazing how you can find an hour to swim when you want to rather than watching and hour of trash TV. Also, I’m a HUGE proponent of indoor training, particularly the spinner on the bike. It’s so much more efficient. No traffic lights, no punctures, no cars. Just set the alarm, 15 mins later you’re warming up on the spinner, hammer out 60mins and then jump straight in the shower. All before breakfast. Tuesday – bike (strength) – sometimes an easier bike in the afternoon. 9. Please share with us the 2 most important take-home messages that you have learnt about endurance training and racing that everyone needs to hear. This is pretty simple I think. Consistency and strength are key. Consistency – endurance isn’t something you gain or lose overnight so by being consistent and just doing something every day and chipping away endurance will improve. Again, that’s the simple equation. Being stronger means one can get through the early stages of a race a bit easier and you can hold form late on each discipline when things get tough. Ultimately it means you have more left in the tank at the end of the race when everyone is hurting. Also, every race has something unique which makes it hard, hills/wind/rough swim etc so being stronger helps with surges for those few minutes when you need a bit of extra effort. I credit the spinner on the bike and track running sessions with the biggest improvement in my performance and the bulk of these training sessions are centered on strength. 10. Any 'life lessons' you've picked up along your journey towards your 1st Ironman? 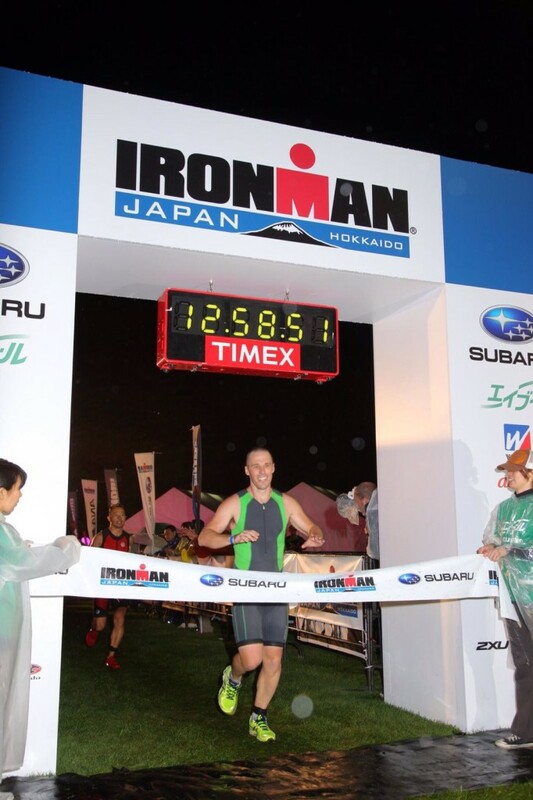 My first ironman was in Japan a few years ago. I remember itwas a really tough bike course and it was wet and windy most of the day. I’m not sure if there’s a ‘life lesson’ per se and it reaffirmed my long held view that the vast majority of the population can do just about anything they want if you put your make the effort. I said before but I’m amazed at the older guys/girls who crank out ironman races. There’s always a contingent of Japanese folks in their 70s and beyond who finish. These guys are amazing. 11. What are the benefits of having a coach? What are the characteristics for a good coach to look out for? The primary benefit is that a coach should have more experience than me and so my training can be tailored better than I can do myself. The coach can help get the balance right in training, I would probably train too hard or not enough or in the wrong areas if I was on my own so having a coach bounce the ideas off is a great benefit. I mentioned earlier that I credit a large part of my improvement to track running and strength work on the bike. I implemented both of these on the suggestion of my coach. Also, whilst it’s a luxury, given I have a normal job and life to live, it’s much easier to outsource the training planning so I don’t have to think about it so much. It’s also a benefit when the coach has more experience than me. 12. I always stress the importance of communication in the coach -athlete relationship. Your thoughts on this please. I chat with my coach at least once a week, often more and yes, communication is naturally important. Critical is for both coach-athlete to be open minded and for both to be comfortable discussing views on training/racing etc which may differ from their own. Coach and athlete need to be aligned in their goals and if there are issues with training, we can discuss this frankly and make sure we’re moving in the right direction. 13. What's next for you? Right now, I need a rest. 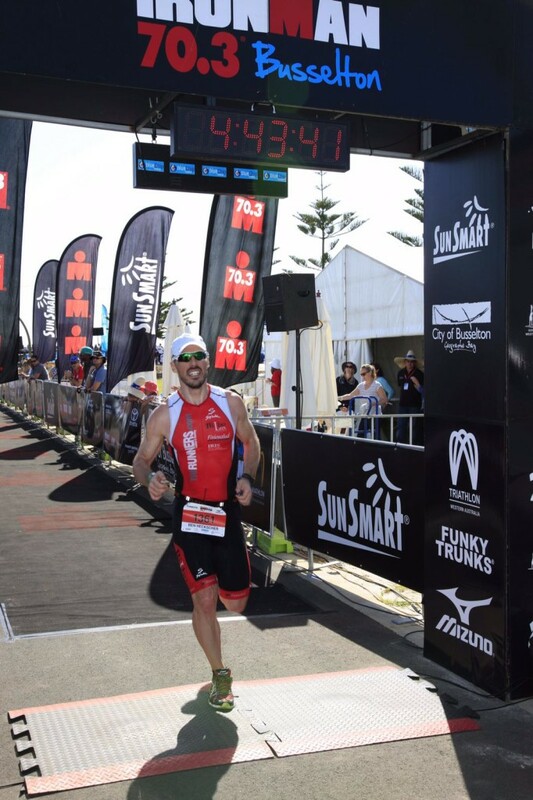 I did Ironman NZ in March, Korea 70.3 in June, Taiwan in October and Busso in December so the body needs a break. There are a few aches and strains that can use time to heal properly before 2017. I’ll have a think about next year soon and will discuss with my coach (and my fiancée) but I probably won’t do a full ironman until the second half of 2017. I enjoy travelling to Oz so maybe a couple of 70.3s in Australia and Busso again next year. Not sure yet. 14. Think you can go quicker… ? No question I can go faster. There’s always something to improve, which is a great thing about the sport. Everyone from rank amateur to world champ will find something to improve on. The actual time is less relevant, each triathlon course is unique so 10hrs in one place is equivalent to 11 on another day, the goal is to keep training and improving. And while I’m able to do so and still enjoying it then yep, I hope to improve. Long term, like anyone who does long distance triathlon, the dream is to qualify for the Ironman World Championship in Kona. It’s really competitive and whilst I’m not quite there yet it’s not a million miles away and I’m sure if I can stay fit and healthy and am able to keep training hard then I can make it happen in the next few years.